In a riverside setting, the white marble statues in York House gardens make a striking scene. 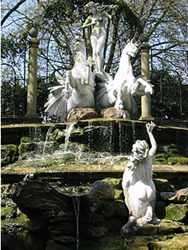 Two winged horses, with a female rider in a shell chariot, plunge through the water at the top of a cascade and pool. Seven other figures are sitting on the rocks or clambering up and holding out - what? Their hands are empty now, but some think they used to hold pearls aloft. Are they figures from classical myths? Are they water nymphs? Nobody really knows. Some call the horses Dragon Horses. The statues were made by an Italian sculptor. They were brought to Twickenham by Sir Ratan Tata nearly 100 years ago. To get them into the gardens a part of the wall had to be taken down. To get the statues into the garden of York House part of the wall had to be taken down. Tata Industries website features Sir Ratan Tata and his philanthropic work.